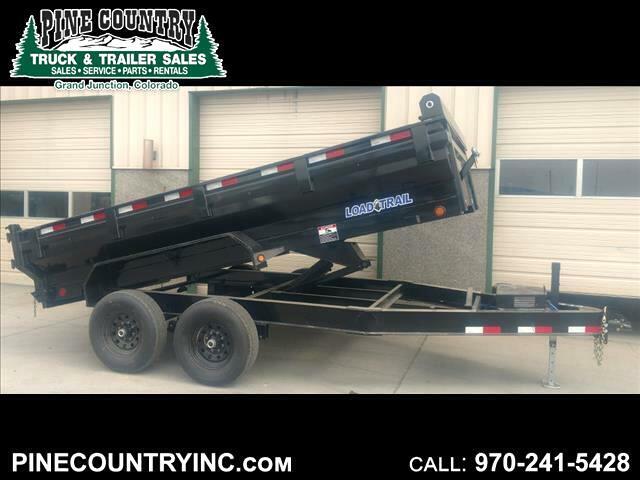 Load Trail 83x14 King Dump Trailer, 14K Rated, Roll Up Tarp Kit, Spare Carrier, Drop Leg Tongue Jack, Black Powder Coated, Tapered Side Walls For Extra Width, All LED Lighting, Slide Out Ramps, D-Rings, Solar Charger, Wall Charger, Fully Self Contained, Adjustable Coupler, Stake Pockets, Heavy Duty Steel Diamond Plate Fenders, Scissor Style Hoist, Industry Best 232 Warranty, Three Way Combo Rear Gate. Three Way Combo Rear Gate. Message: Thought you might be interested in this 2018 Load Trail DT142.